My townlands project is one year old today. My first post appeared on 10th October 2014. To mark the anniversary, here are some photos from a special place – the townland of Aird. 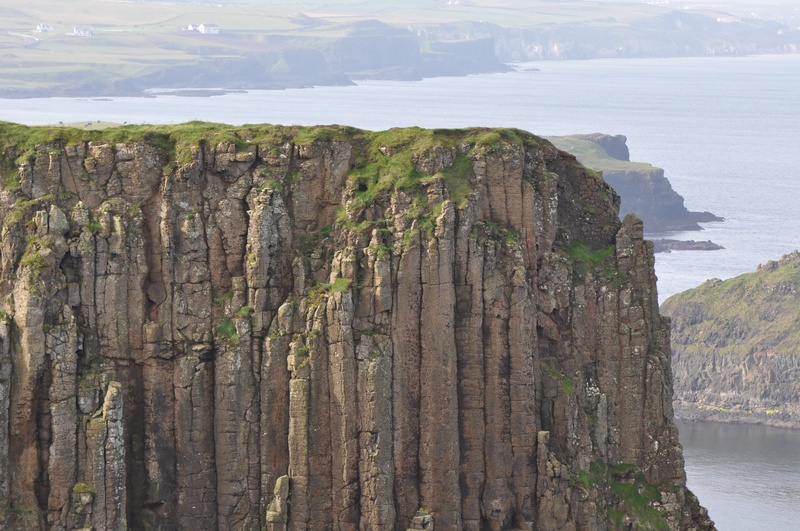 The name “Aird” probably comes from an Irish word meaning “headland”; and this is a pretty spectacular headland; but I’m not going to tell you its location yet. Taking my first step into a photoblog of townlands last year was nerve-racking, like stepping from Aird townland onto this stone pillar. The early posts were sketchy, and I had little to say about the first three townlands of Ballylisbredan, Ballyministragh and Scrabo. This week I have added new material to build those posts up into something more substantial. Since then the number of posts, and the number of readers, have increased. Aird is my 69th townland. How will I ever reach the final townland? There are more than 1200 in County Down alone. I hope this website is becoming a useful resource, and I would love to hear from readers. Leave me a comment below, or follow me on Twitter (@distantdrumlin) or Facebook (the Townlands of Ulster page). As you’ve all guessed by now, the townland of Aird is the home of the Giant’s Causeway. 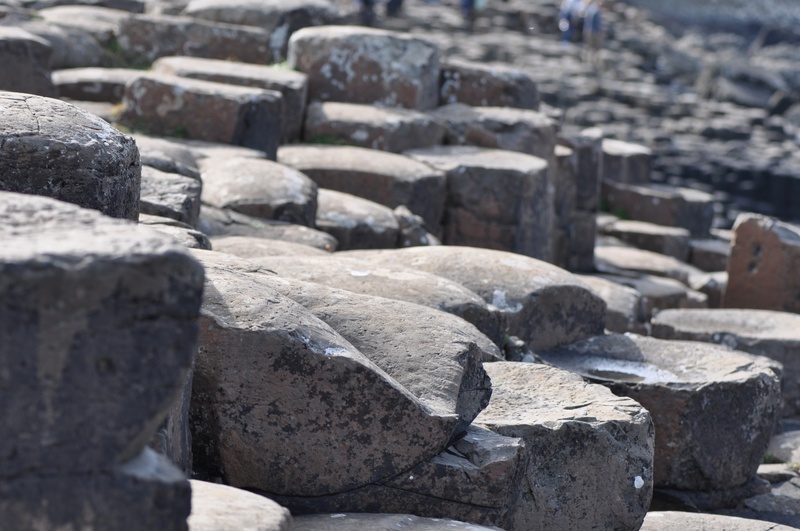 The Causeway’s 40,000 interlocking basalt columns were built as a pathway by the Irish giant Finn MacCool (Fionn Mac Cumhaill) who was off to Scotland to fight the (even larger) giant Benandonner. Or, if you prefer, they were formed by the slow cooling and contraction of thick lava flows from a volcanic eruption 60 million years ago. 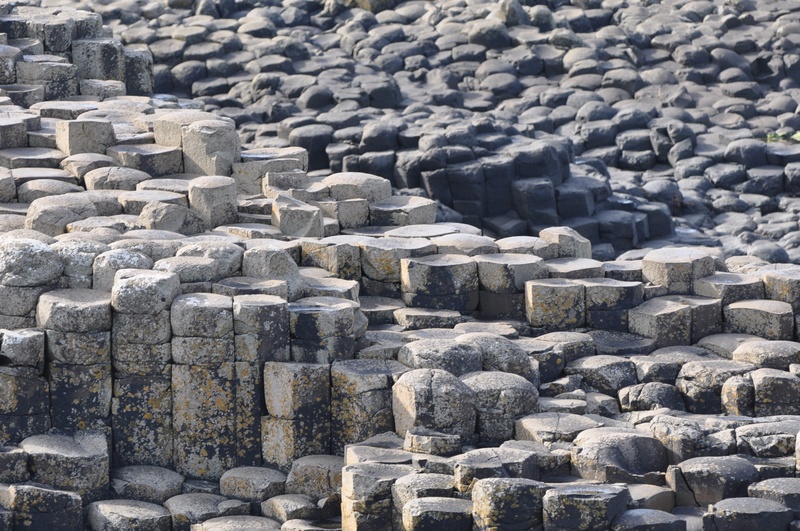 UNESCO added the Giant’s Causeway and Causeway Coast to the list of World Heritage Sites in 1986. The National Trust provides parking and a visitor centre at the Giant’s Causeway. Click here for more details. 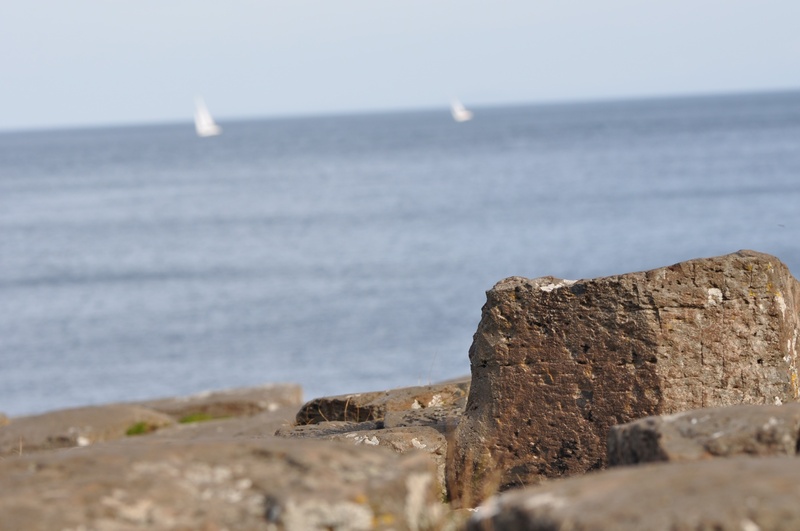 The best way to see the Causeway Coast is to walk. Click here for route details and map of the Giant’s Causeway Yellow Trail. 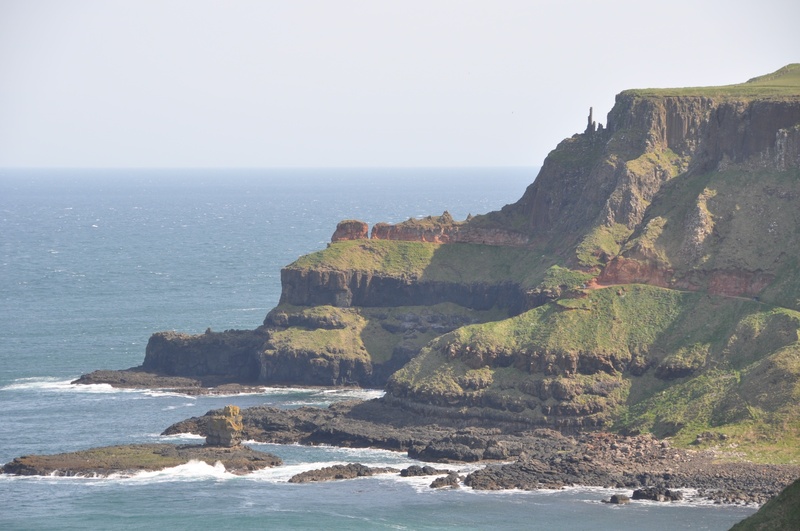 That is just part of the longer Causeway Coast Way – Click here for more details. 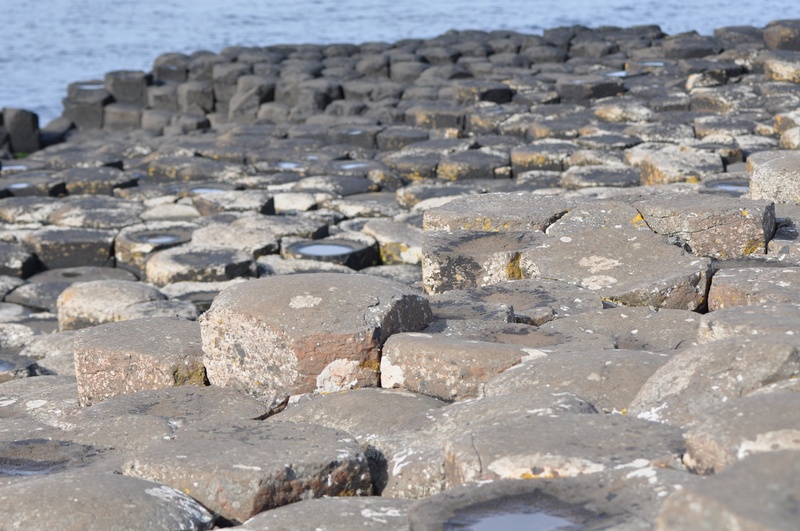 Which other townlands lie close to the Giant’s Causeway? The Visitor Centre is in the townland of Ardihannon. As you walk east towards the famous rock formations, you reach the townland of Aird. Further east along the coast lie the townlands of Lisserluss and Tonduff Mountain. West of Ardihannon is Ballylinny and then the townland of Dooey. Inland from the Giant’s Causeway lie the townlands of Carnside and Ballymoy. Which council area is Aird in? Causeway Coast and Glens Borough Council. Which county is Aird in? County Antrim. Finally, click here for the PLACENAMESNI website to see a map of the townland of Aird. No information has been uploaded yet about the origin of the name, but I have read elsewhere that it probably comes from an Irish word meaning “headland”. I am thoroughly enjoying all your posts for the townlands. My husband s family came from Ballymacaramery. Thanks for the lovely comment. I am planning to visit the National Trust house and gardens at Rowallane soon (Leggygowan and Creevyloughgare townlands, south of the town of Saintfield), so I’ll add in a side trip to Ballymacaramery. Thank you. I’ve been there on wet and windy days, but this time I was travelling with some Australian friends and the weather was perfect. Hopefully they will go back to Australia with good reports of Northern Ireland. We visited the North Coast of Co Antrim from Australia and I can assure you we had nothing but great things to say about the scenery and people. An absolutely beautiful part of the world! I’m so happy to read great comments like that from Australia. I’ve seen your Great Ocean Road, and I know you have fantastic scenery of your own. Now I just need to return and do a lengthy, leisurely road trip around the rest of Ireland. I really love this blog – it’s an oasis in my inbox. I’m looking forward to you covering my patch of Carnesure, Ballynichol, Drumhirk and Magherascouse. Your patch will feature soon. I drove along the route you told me about. I don’t think we should tell anyone else. It’s too beautiful. I was amazed at the view towards Scrabo just before you hit the Drumhirk Road. Simply amazing. 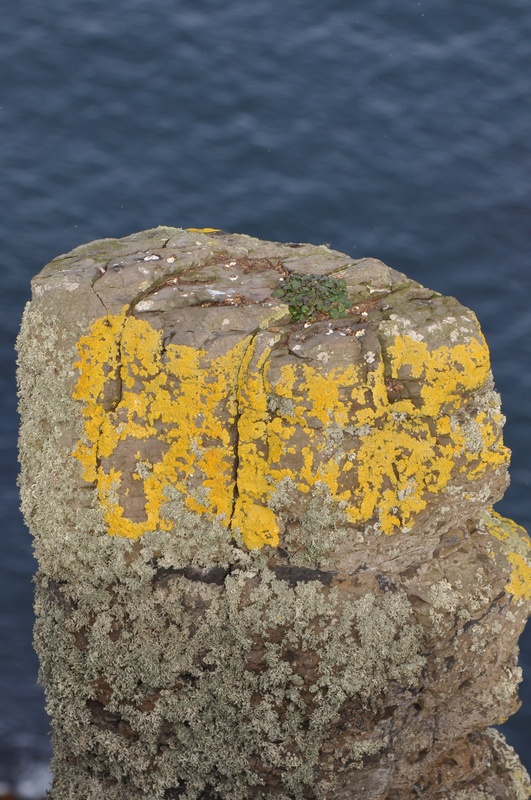 I love the yellow lichen on that pillar. I was the brave one in our party. Not everyone was so keen to lean over the cliff to look down on the pillar. I enjoy your blog too. Looking at your beautiful posts from the Mournes and the North Coast, you would think that the summer of 2015 had been full of sunshine. Haha thanks Karolyn. I work hard to maintain that illusion lol. Congratulations!!! I love how you provide such interesting windows into worlds that seem quite far away from the cacophony and chaos of everyday life in Mumbai. Here’s to flourishing readership as delighted as I to enjoy all your fabulous photos, stories and insights into the townlands of Ulster! Thank you. If only we could send you some of our water. We have plenty of water, always. You could send us some Indian sunshine in return.